It’s Hard Out Here for a Mom! I cannot believe my baby girl will be six months tomorrow. 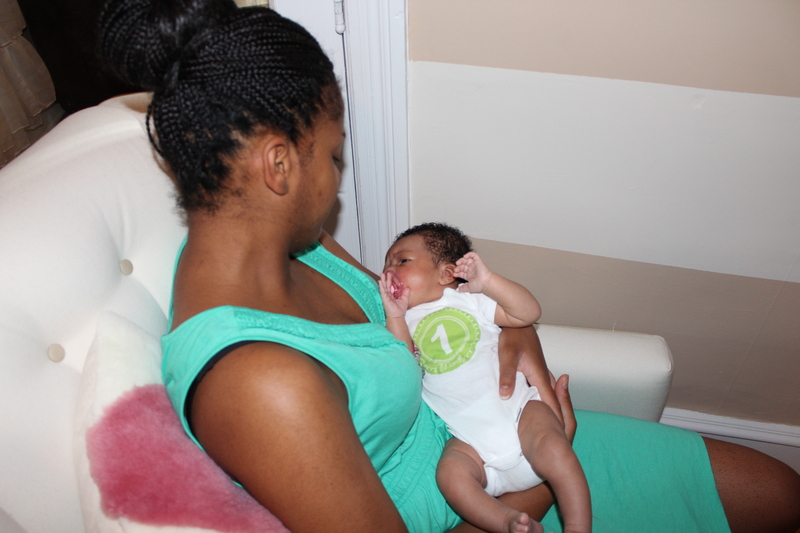 This past half year has been full of excitement, and I am truly embracing motherhood. Prior to even becoming pregnant, some people would say with sarcastic tones in their voices , “Wait until you become a mother!” or ask, “Are you sure you want to be a mother?” Though I thrive on being positive and have never questioned whether or not I made the right decision becoming a mother, there is no denying that it can be hard out here for a mom! I think about how blessed I am to have a flexible teaching schedule that allows me to spend most of the week with my daughter. It saddens me to know that many mothers do not have that luxury. In order to provide for their children, some mothers must work from very early in the morning until late in the evening only seeing their children for dinner, bath and bedtime, sometimes not even for those daily routines. When a person says, “I got a habit,” most automatically associate it with something negative? “Habit Factor” by Martin Grunburg did an excellent job touching on how habits can be negative or positive in relation to achieving goals. Ever since I can remember, I’ve always set forth goals to achieve. A major reason I started this blog is actually to have a place to discuss my journey and share some of my musings and goals. In an effort to live my best life while hopefully impacting the lives of others in a positive way, I decided to become more cognizant of my actions and daily routines. This allows me to make sure my actions (or habits) are in alignment with my goals and the person I claim to be. 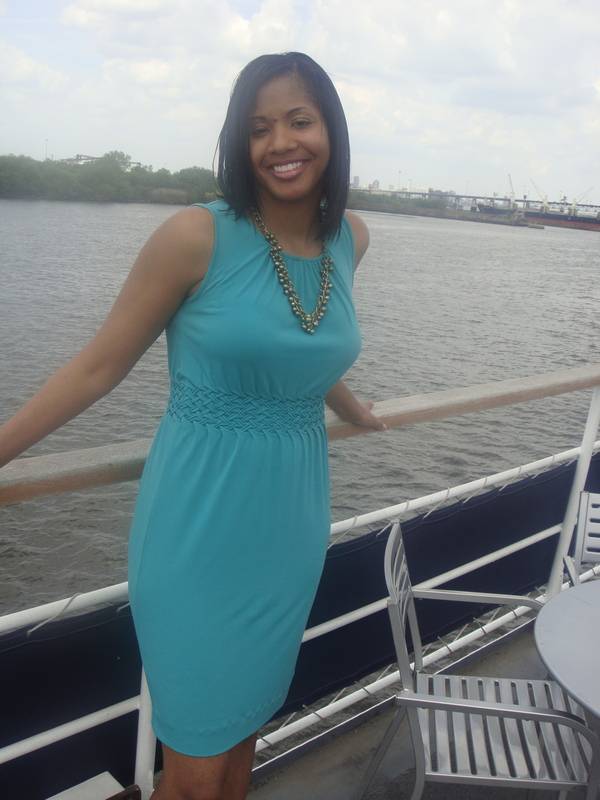 For instance, one of my most recent goals was not just to reclaim my pre-pregnancy body (I just had a baby on May 3, 2013) but to have a healthy lifestyle. So I first determined what habits would put me on the right path and began tracking how consistent I was. Rather than saying, I am not going to eat junk food, I thought about what I was going to do, such as meditating, drinking a minimum of eight cups of water a day, eating a minimum of seven servings of fruits and vegetables per day, and walking and exercising five to six days a week. I can be quite competitive, especially with myself, so tracking my habits makes me want to push myself even further. If I see that I had seven servings of fruits and vegetables all last week, I will try to make it eight for the following week. Also, the accountability is there. Sometimes we all get so busy and do not realize how much time has passed since we have last worked out after we set forth the goal. Logging the information gives me the data I need to have tangible evidence on why I have or have not achieved my goal. Since I started tracking my habits with my healthy lifestyle back in July of this year, I lost 16 1/2 pounds, putting me about three pounds under my pre-pregnancy weight and lost a total of 18 inches from my waist, hips, thighs and arms. 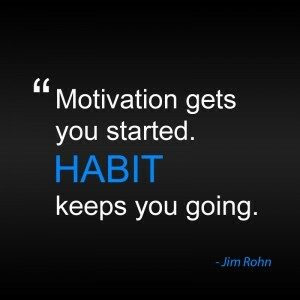 I feel more energized and am motivated to keep up these good habits. Many of us question why our lives have or have not taken certain courses but do not always look at our habits (actions) to determine how significant they are in why we are where we are. Even though there are instances where circumstances arise that are out of our control, our habits are not. We typically control those. The next time you question why you are struggling to reach your goal, consider your habits. They truly can reveal a lot and certainly did for me. 1. Dispel the myths and statistics: Though losing that pregnancy weight along with that jelly belly can be difficult, do not buy into those notions of it being impossible or highly unlikely that you will return to your pre-pregnancy weight. Be aware of but disregard the statistics about most women struggling to lose the last ten or five pounds. Refuse to accept the statistics as absolute. Listening and accepting the myths and statistics will give you an excuse for not shedding the pounds. 2. Believe: You must believe that you are capable of losing the weight regardless of what anyone else says. Believing starts in the mind, heart and through your actions as well. As you believe, you must stay motivated. 3. Be an idealist and go for what’s not realistic: Of course, you want to be safe about it, but go for the unrealistic goal! People may say give yourself at least a year or two, but why? Once you give yourself that timeline, you just might use it as an excuse for why your weight hasn’t budged much since you gave birth. 4. 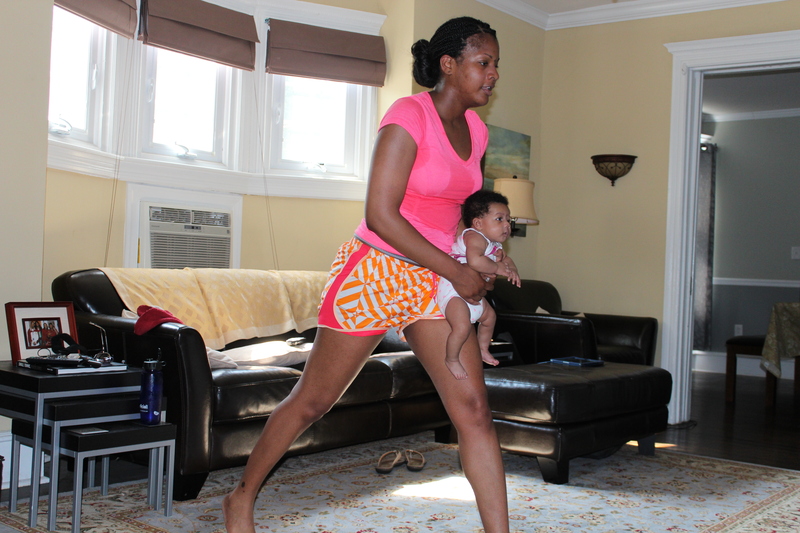 Exercise: It is obvious that exercise is needed, but it is essential to find exercises that include the baby to avoid additional stress of trying to find time or a sitter in order to work out. My baby and I do the “Happy Baby Work Out,” go for walks, with her in the stroller, everyday, unless it is raining, and she does patiently watch as I do my “Hip Hop Abs” workouts. She seems to really like some of the exercise routines. I also, find that it is best to workout in the morning if possible. It gets the heart pumping and metabolism kicked into high gear. 5. Eat Healthy: This is another one that is a no brainer, but the trick is not to simply avoid junk food but to introduce more healthy foods. For instance, I eat a minimum of seven servings a day of fruits and vegetables. After meeting or exceeding that goal, there is not much room left for the junk. Also, I am always thinking of healthy alternatives. Did you know that maple syrup has about 220 calories per serving, but the sugar free version only has about 20 calories? My husband even admitted that he cannot taste the difference. 6. Make it fun and your actual lifestyle: It’s not about going on a crash diet, completely denying yourself all guilty pleasures and dreading having to exercise, especially if you are breastfeeding, but it is about a lifestyle improvement. Getting back in shape has multiple benefits. It of course makes you look and feel good, but it gives you that extra energy to be there for your baby who you will soon be chasing after when she or he learns to crawl and walk. Where is the “Cutomer” Service Desk? While many people, especially those forty and under say, “Why do I need to know how to spell? I got spell check and auto correct,” I am trying to come up with ways to get students under my “spell” stressing the importance of not only spelling correctly but proofreading for often confused words and grammar issues as I prepare for the fall 2013 semester. It really can impact one’s ability to communicate clearly and effectively. Of coarse, sum people take it fir granite that spell check will catch there miss stakes. 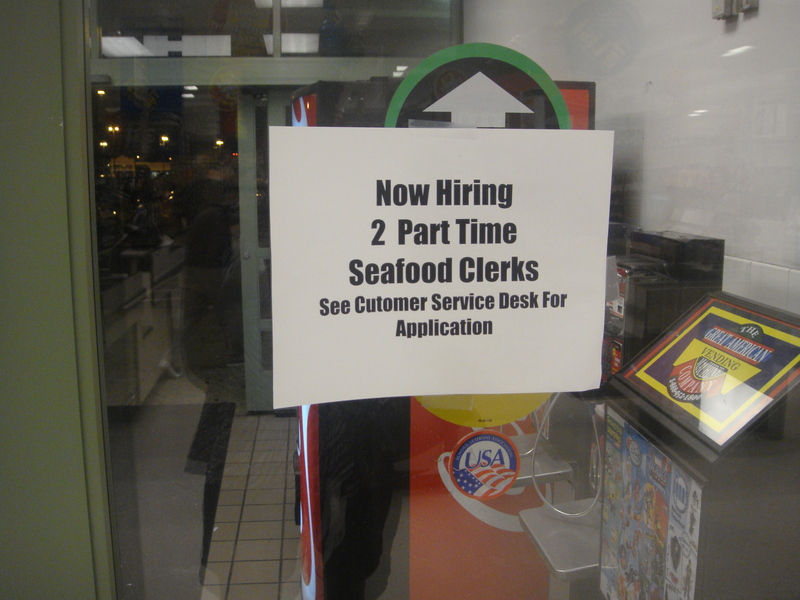 Than they submit there resumes wit misspellings and wander why they don’t be gettin called in for intervues. They might be gud at wat dey do and have a grate work ethic, but the resume screener ain’t gonna get past the spelling issues cuz ain’t nobody got time fa that! Is spelling correct a dying art along with grammer, mechanics and basic proofreading as moor and more people simply except misspellings as da nu standard? Admittedly, I think its cool to use slang and text language cuz it is a language in and of itself, but the ability to cold switch, composing documents free of misspellings, grammar an mechanical errors for professional purposes or even to git ya point a cross clearly, is essential. i refuse to believe that i am a loan wit dis concern and dat standard english and spelling words correctly will one day be considered archaic and that I will than be come a english historian providing in cite on wat once wuz. u kno wat i mean? PS. I hope you noticed the plethora of misspellings and grammer issues in dis post. Wich ones did u spot? Were there times wen u paused to figure out wat i meant cuz of the misspellings? Du i got u under my spell? Relax Her? She’s Just a Baby! “I see Quinn’s hair has turned from straight to a curly little afro. She’s going to need a relaxer soon” is what I was told most recently in a joking way. Though I laughed it off in an effort to not be overly sensitive, I did not see the humor in this person’s observation, just the implications that come along with such a statement. Was this person suggesting that straight hair is beautiful, but curly hair is ugly? It made me think about Chris Rock’s 2009 documentary “Good Hair” and how much of an impact this obsession with not just hair but looks in general has on all people, but definitely females. I mean, even a three month old baby girl does not get a pass! 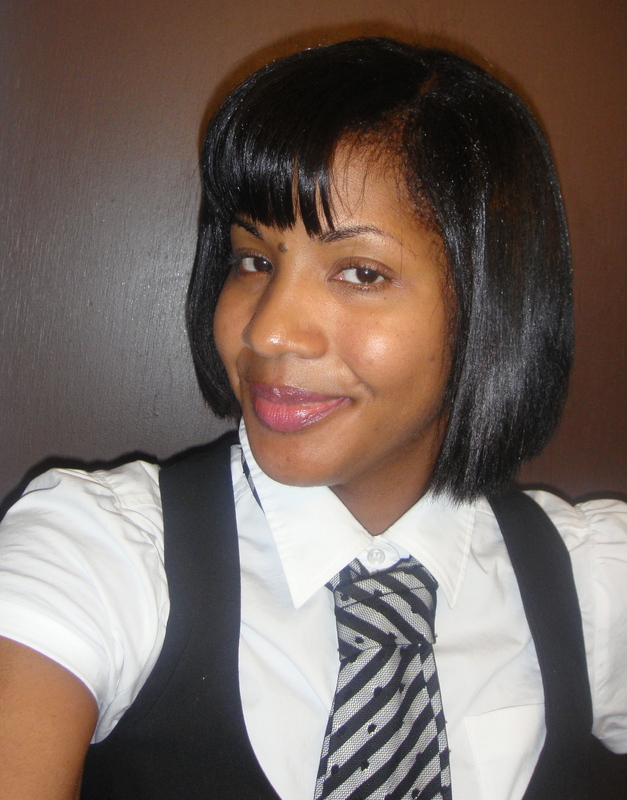 Almost fifteen years ago, I decided to stop getting relaxers to straighten my hair because I like the versatility of being able to wear it curly or straight if I wish. Plus it is much healthier. Initially I struggled with feeling comfortable wearing my hair in whatever “natural” style I wanted in certain settings for some time, but I am finally able to appreciate my natural beauty and not as caught up in how I am perceived by mainstream society. It is up to me to lead by example. My hope is to teach my little girl to embrace her natural beauty and to not develop a complex or be apprehensive about rocking an afro, twist out, even dread locks or straight if she prefers. Should she choose to apply chemicals to her hair to make it straight or a different color, I want it to be because she wants to do it, not because it is necessary in order to be considered attractive or to fit in with what is considered acceptable. How would you or did you address this issue with your child. Please feel free to share. Hurry, grab the camera! The baby is smiling again! I have been obsessed with seeing my baby smile for the first time and every time after that. Interestingly, little Quinn had absolutely no problem frowning or making a face to display discomfort immediately after birth accompanied with a piercing cry. 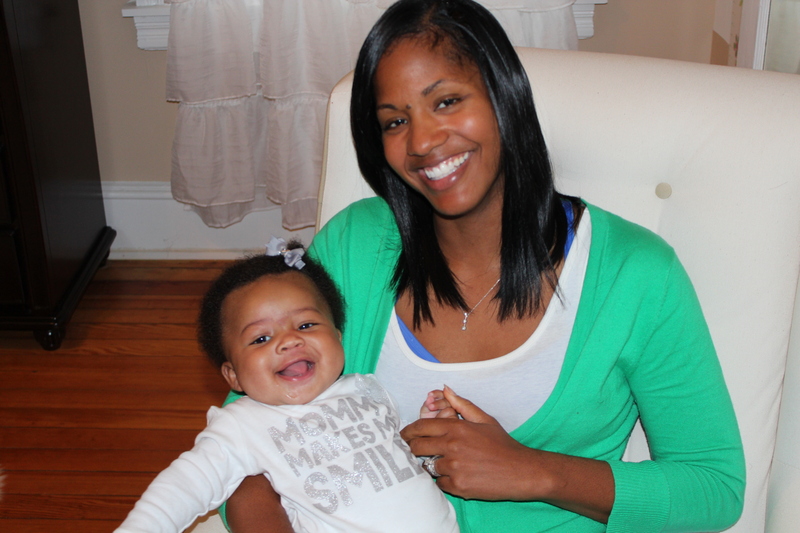 But with eager anticipation, I waited about two months for that first “real” smile (Not from gas or in her sleep). Why aren’t we natural born smilers? Is it that we have nothing to smile about at birth and are miserable? My husband and I discussed this, and he deduced that it is all about survival instincts, and smiling and laughing will not get a baby fed, but frowning and crying will. I’m sure he’s onto something because feral children who were severely neglected and had little to no human contact typically do not know how to smile and must be taught through human interaction. Seeing my baby smile for the first time and now smiling each day has me thinking about what a major milestone it is. Imagine going through life and never smiling or not even knowing how to smile. I’m sure we all know someone (Hopefully you are not that someone) who always has a frown or sour look on his or her face or might even have a permanent frown upon reaching a certain age from constantly putting a frown on his or her face in the past. When you were a little baby, someone’s face lit up upon seeing you smile or hearing you giggle, so why not make a more conscious effort to smile as adults? Some people may say, “I don’t have anything to smile about.” But having the ability to smile should be reason enough. Though I was not always a smiler, especially during that awkward adolescent stage from preteens to early adulthood, I have learned the significance of smiling, and seeing my little girl smile has reinforced that lesson. I always greet her by happily saying, “Good Morning,” and she usually responds with a big smile. This has confirmed for me that how we start off the day and how we greet others is very important for us as well as the people with whom we come in contact. Whether it is a big teethy smile at my students in the morning, a small one at a passerby during a morning walk or at the cashier as I pay for my items, my smile just might brighten up someone else’s day. Have you smiled today? If so, how many times? The more the better is my philosophy. 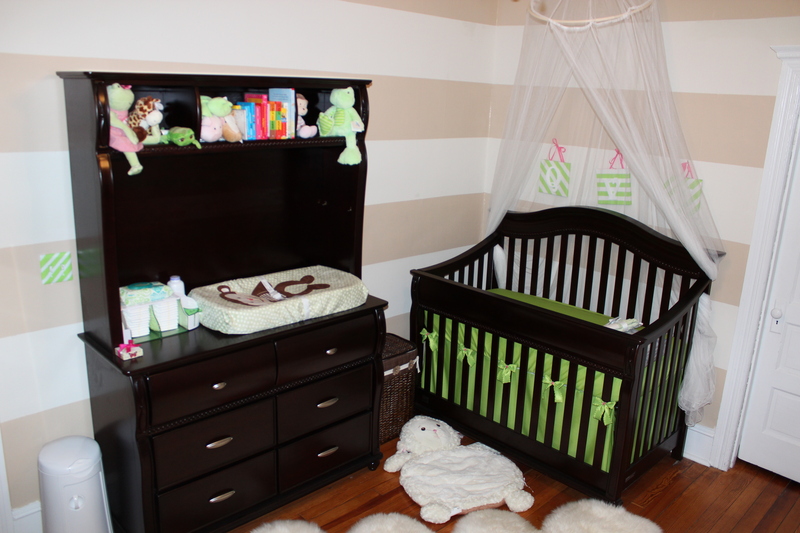 Putting together a baby nursery, especially for your first baby, can be a lot of fun, a bit overwhelming at times and potentially costly. For me, I was eager to put my crafty DIY skills to work to save a little money. 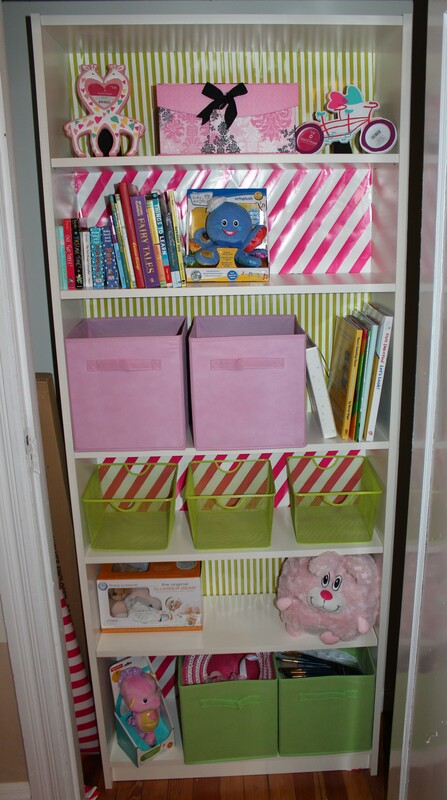 After completing my baby’s nursery, I received many compliments and figured I share some of what I did to help anyone out who is currently working on a baby nursery or will be in the future. For more longevity, I decided to select colors (cream, taupe and green with pink as the accent color) instead of a character, animal, alphabet theme, etc. Also, I chose many items that will grow with her and that I can get more use out of even once they are no longer a part of her room. 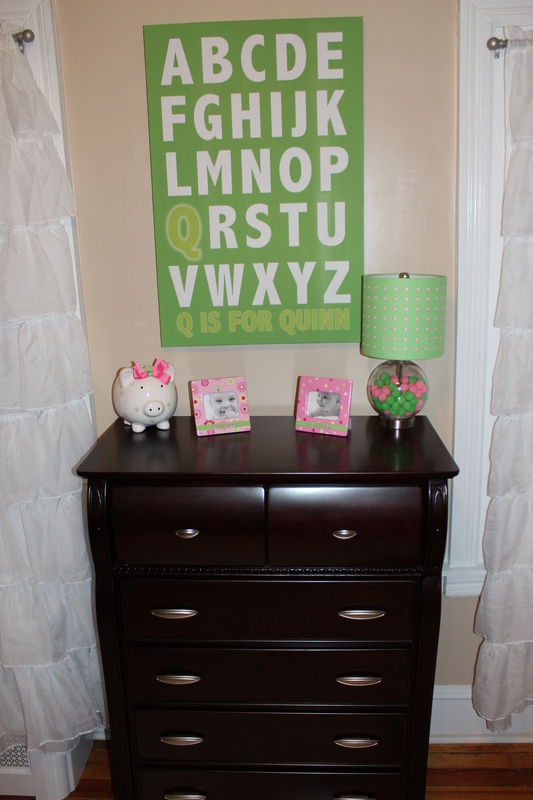 Many people want to personalize their baby’s nursery, but how personal is it really if it has been mass produced, and your child’s name is just inserted in a blank space? 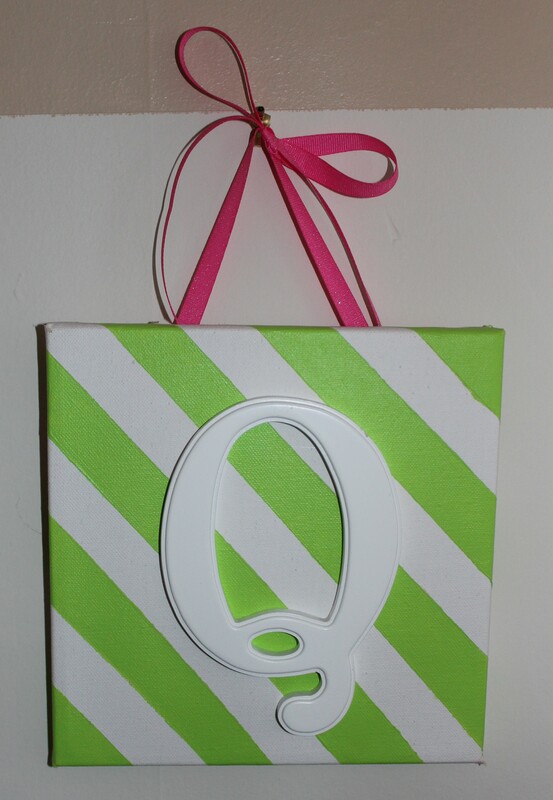 Even though I have no aversions towards mass produced items, I decided to do something simple yet different for baby Quinn’s nursery especially since I just could not find what I wanted for wall art. I decided against bumpers because some medical professionals stated that they can be dangerous, but most bumpers have those pretty bows I wanted for Quinn’s crib. So I created my own after watching a few Youtube videos and then used velcro to attach them so that they would not damage the crib. 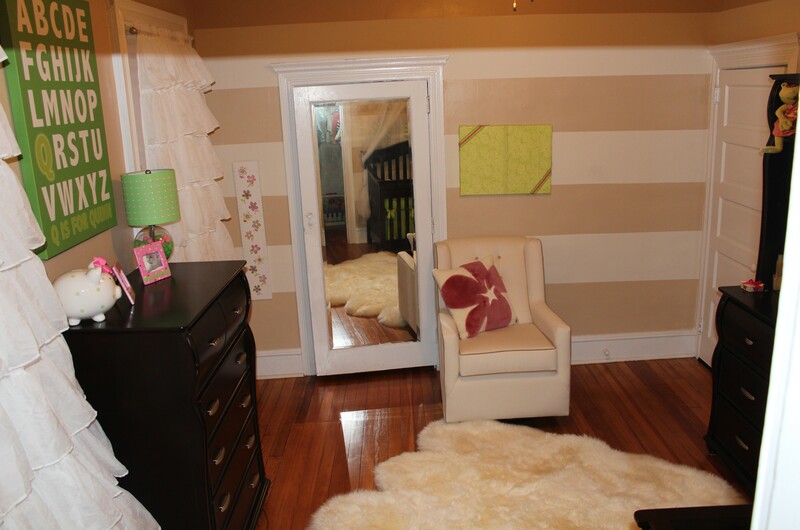 Click the image to not only see the bows better but the stripe canvas wall art and light switch too. 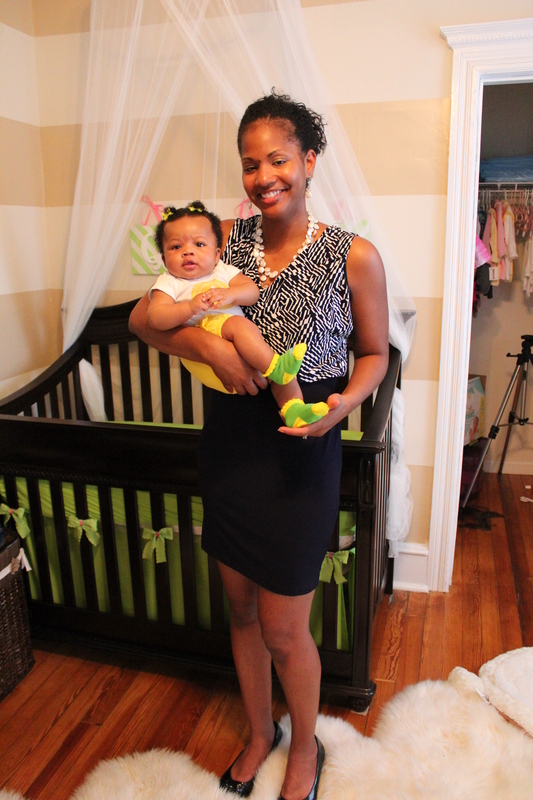 Even though I enjoyed designing the nursery and made it a huge production, when Quinn was born, and I excitedly brought her to her nursery, I realized that none of what I did matters to her, at least not yet. But my hope is that she will come to enjoy spending time in her nursery and that it will be a welcoming environment for her. If you have any questions or feedback on what I did for Quinn’s nursery or on any items in the nursery, please let me know. Part of my journey is not only trying to figure this motherhood thing out but helping other mothers (and fathers too) along the way if I can.